Given this week’s tragic events, I paused before starting to write this column. Atelier, Carré des Feuillants, Pierre Gagnaire and the likes might have been my subjects at any other time, but not at this one. To celebrate life, friendship and camaraderie, there is nothing better than French bistros or brasseries. Happy people search them out to have fun, to enjoy each other’s company and to relax. So I thought of La Fermette Marbeuf, which fits the bill perfectly. As it happens, sometimes you don’t have to be an archaeologist to stumble on a major discovery. I imagine that’s how French workers must have felt back in 1978 when they broke through a wall while performing renovation work in a non-descript Paris restaurant. Beyond the wall, the magnificent but forgotten Art Nouveau interiors of a pre-existing dining establishment emerged from the darkness. It turns out that in 1889, the young and obviously talented duo of Hurtre (an architect) and Wielhorski (a painter) were charged with renovating the rooms of the Langham hotel on what was then rue Boccador. The results of their hard work are a joy to behold today. La Fermette Marbeuf (the interior of which is classified as a French National monument) is a treasure trove of stained glass (birds, flowers and a rendition of Botticelli’s spring are easily recognizable) and period furniture. It really is one of the prettiest dining spots of the French capital, which is saying something, given that Paris isn’t exactly short on beautiful dining destinations. The food at La Fermette Marbeuf is revisited classic French fare: so snails, butter, lamb, chicken, puff pastry, salmon and soufflés are everywhere in sight. The food is solidly prepared if not particularly exciting, but it’s not excitement and fireworks one comes here for. 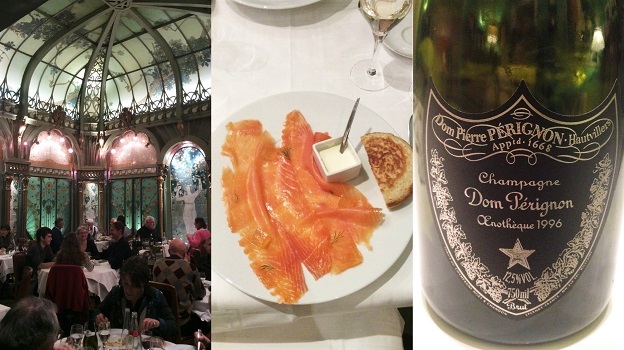 I especially recommend the smoked salmon, the asparagus in puff pastry and always, the Grand Marnier soufflé, which is truly marvelous, and should not be missed. On the other hand, the wine list at Fermette Marbeuf is old Paris bistro-typical: short and compact. Although it sports little known wines and producers, I do think a little more effort could be made here. Clearly, even just a few older vintages from choice producers would greatly enhance the dining experience. So rather than risk disappointment, I decided to start off dinner with my own bottle as an aperitif, going with the spectacular 1996 Dom Pérignon P2 Champagne. Still quite young, the 1996 showcases the unique combination of fruit ripeness and eye-watering acidity that the best 1996 vintage Champagnes exude in spades. It is truly a monumental wine, with a seemingly endless finish that is absolutely marvelous and memorable. Really, I couldn’t have hoped to start my meal off any better. Great Champagne aside, I am a huge fan of Pouilly-Vinzelles, finding the wines generally underrated, especially when compared to the better known, usually more expensive and oft-underachieving Pouilly Fuissés. The 2012 Louis Latour Pouilly-Vinzelles En Paradis is admittedly not the second coming of a Montrachet, but it is bright and fruity, offering graceful, clean, lemony yellow plum and delicate white flower nuances. It is also distinctly richer than the higher acid, somewhat leaner 2013 vintage of this wine). It is a joy to drink at the table, as it cuts through some of my luxuriously fatty dishes very well, readying my palate for more mouthfuls of both food and wine. One of the most northerly red grape growing areas of France, just south-west of Chablis, Irancy was awarded an AOC only in 1999, and its wines are made essentially from Pinot Noir (though some growers blend in small amounts of César, a variety even most French wine lovers don’t know much about). Irancy wines are generally fresh and fruity, blessed with high acidity, making them swell if uncomplicated dining companions. And as I write this column with Paris on my mind, allow me to point out that Irancy’s other claim to fame is that Jacques-Germain Soufflot was born there. Soufflot is the neo-classical architect who designed the city’s beautiful Pantheon building. Made from thirty-five year old vines grown on Kimmeridgian limestone and clay soils, the 2012 Simmonet-Febvre Irancy is a rare Burgundy blend, as 5% César is included along with the Pinot Noir. The little known César is a late ripening grape that adds color and tannins; in this wine it makes its presence felt right from the first sip, providing a dark crimson hue and a mouth coating chewy tannic hit that arrives late. Although certainly not the last word in complexity and even a little austere on its own, the wine really blossoms when tasted along with the lamb, gaining in flesh and volume. 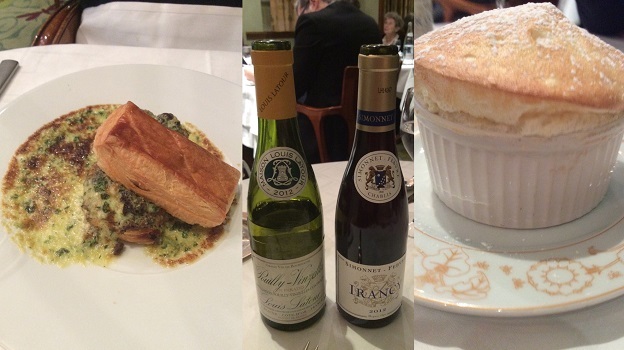 La Fermette’s sublime Grand Marnier soufflé rounds out this delicious meal. When all is said and done, you’ll find yourself walking out of La Fermette Marbeuf appreciating the little and solid things in life.